One of the most exciting parts of our 1:1 initiative at BHS is the fact that we are one of the first schools in the state of Massachusetts undergoing a full scale 1:1 implementation. In addition, we are one of the first schools nationally to implement iPads for every student. As we continue to explore all the ways we can take advantage of our 1:1 environnment at BHS, we are excited to help improve the technology available to all students, by providing a test bed for new technologies. That’s why we will be hosting a free SAT practice test from a start-up out of MIT called Testive. Testive is making a rapid diagnostic test for students preparing for the SAT. It allows students to get an SAT score and feedback on their strengths and weaknesses in 30 minutes of testing. They use the same approach that the GMAT and GRE use in their graduate school admissions tests. The test questions are administered on a computer and get easier or harder based on how the student is performing on the test up to that point. As part of the test, we will be providing our students the chance to take a practice test in the same environment in which they will take the SAT and at the same pacing. Students will use the Testive software to take a full-length SAT practice test via their iPads. That way, students will get their scores as soon as they finish and can identify where they need to practice. In place of the usual experimental section, students will take Testive’s adaptive SAT. 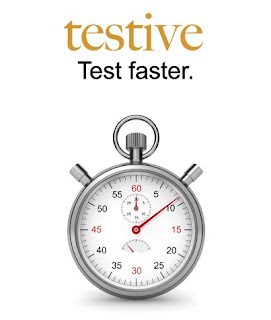 Testive will use those results to calibrate their half hour test so it is fully aligned with the SAT. This is great and quite innovative!!! I'm sure that the student are interested in this wonderful endeavor!!! I wish that I had this when I was a student in high school! As you might imagine, we feel the same way.